In another record-shattering day at the Standard Chartered Dubai Marathon, Ruth Chepngetich of Kenya became the third fastest woman in marathon history when she clocked 2.17.08, taking over two minutes off the 12 month old course record, and a minute off her own personal best, while more than hinting that, at 22, she might just be the woman to threaten Paula Radcliffe’s superlative time of 2.15.25, from London 2003. Not to be outdone, Getaneh Molla of Ethiopia ran the fastest debut in history in breaking the men’s course record, also a year old, by half a minute, with 2.03.34, making him the sixth fastest man of all time. In the women’s race, Chepngetich was followed home by former winner, Worknesh Degefa of Ethiopia, who also obliterated her personal best by just over two minutes, with 2.17.41, which makes her the fourth fastest in history. 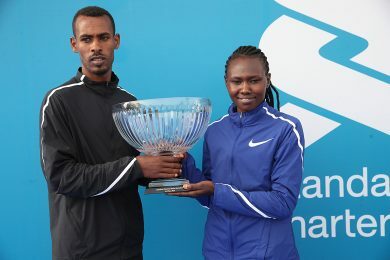 Although she lost ground in the last third of the race, staying with the leading duo for so long ensured that another Ethiopian, Gurmesa Edesa took three minutes off her best, finishing third in 2.21.05. Likewise in the men’s race, Molla was tested until the final kilometre by compatriot Herpassa Negesa, who finished second in 2.03.40, excising over five minutes from his best, and securing him in eight place in history. There were mixed fortunes for another Ethiopian, Asefa Mengstu who finished third in 2.04.24, for though he improved one place from last year, he was 18 seconds slower. It will be little consolation to Degefa to know that a time of 2.07.41 has never lost a marathon before, and indeed she contributed amply to Chepngetich’s success. The Kenyan was having problems identifying her drinks’ bottles at feed stations, and regularly fell behind at each table. When the pair had dropped Edesa and the rest before 35k, the same thing happened again, and having followed the Kenyan up to that point, Degefa saw the opportunity to steal a march, with the objective of repeating her 2017 victory. She forged ahead, which woke Chepngetich to the danger, and she immediately launched her long drive to victory. It is a possibility that the lost time searching for drinks cost her the Kenyan/African record, held by colleague Mary Keitany, the second fastest in history with 2.17.01. But as Radcliffe, having commentated the race, drily observed about the danger of her record falling to Chepngetich, ‘She has the time; at 22, she is far more likely than any of the older women,’ a nod surely in the direction of the 36 year old Keitany, who has long been touted as a threat to the 15 year old world mark. Since her marathon debut in Istanbul 2017, winning in a very respectable 2.22.36, followed by a slightly slower second place in Paris in early 2018, the diminutive Chepngetich has taken giant strides. She returned to Istanbul two months ago, and ran four minutes faster than the previous year (2.18.35), and shooting into seventh place in history. She brushed off the fact that there are some potentially disruptive ups and downs in the final stages of the course, with, ‘I train on hills, so I was not bothered’. The corollary to that is 2.17.08 on a completely flat course. Molla said that he did not know what to expect from his first marathon, but that, ‘It certainly was not 2.03. I was hoping for maybe 2.05, 2.06’. But the possibility was always that a man who can run sub-13mins for 5000 metres (just) as he did last summer was going to thrive in the marathon if he put in the work. That much was evident in the comfort and easy striding style he manifested as his more fancied compatriots, and Kenyan Emmanuel Saina dropped off the group of ten which maintained the sort of pace that was going to ensure a fast final time. The surprise was that it was regular 2.09 man, Herpassa Negasa who provided the springboard for Molla’s victory, dictating the pace which resulted in the pair ending up alone in the final kilometres. But it was the debutant who prevailed at the death. And despite his record debut victory, he indicated that, having won the Ethiopian 5000m title on the track four times, it was at that distance or the 10,000 metres that he wants to compete in the World Track & Field Championships in Doha later this year. He can be sure that he will not experience there the same sort of weather conditions here today, which could barely have been better for this part of the world. The local media has been complaining all week about the ‘cold’ weather, which is to say the thermometer has barely climbed above 21C (70F); but starting before dawn in 16C (60F), and benefiting from cloud cover which kept the temperature at that level all race, meant that the athletes delivered.  In the last decade, since an influx of cash from the Dubai government, the marathon organisers, abetted by a flat, fast course have tempted the likes of Haile Gebrselassie and Kenenisa Bekele to beef up their kudos and record credentials; but, equally some little known athletes have made strong and rapid debuts here, contributing to some of the best in-depth marathon results anywhere in the world. Now in its 20th year, with some of the fastest times in history, Dubai has further burnished its claims to maintain a high ranking in the world of major marathons.